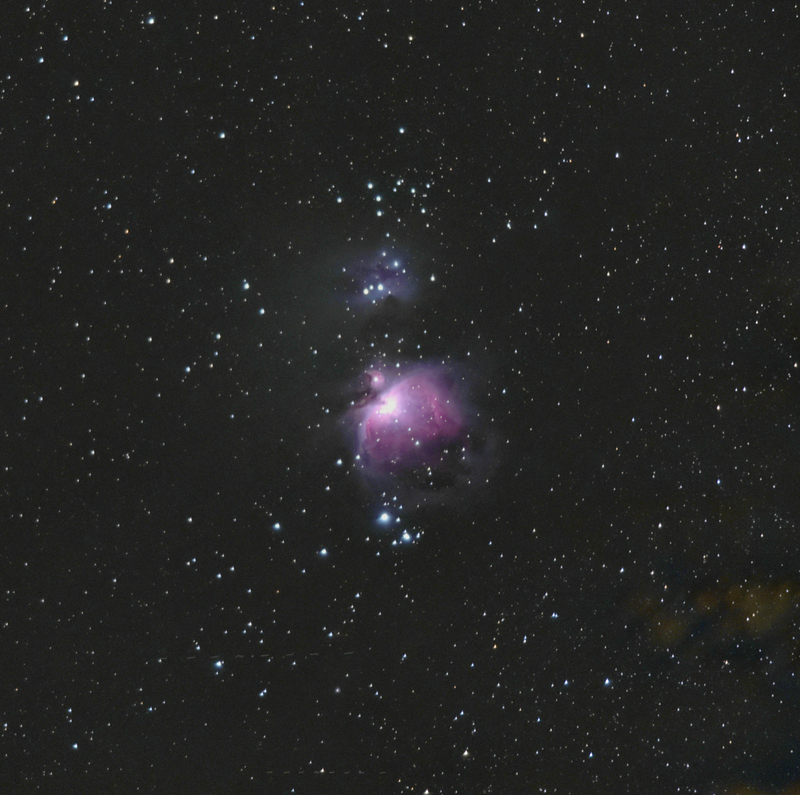 I spent some time this morning with PixInsight on a stack of M-42 images. This is the result. PixInsight is an impressive, though oddly challenging, piece of software. The interface still eludes me at times. The results are splendid, however. All images were aligned using stellar centroids. The images were then stacked… this is an image integration of 100 seconds worth of exposures. PixInsight was then used to do a Dynamic Background Extraction to essentially perform a flat field thus removing the lens’ vignetting. I still can’t get over this process: no flat fields required… though I bet real flats would result in a better overall image. The camera does its own internal bias and dark subtraction. The image was then brought into PhotoShop for adjustment to levels and cropping. Now… compare that colorful image with the monochrome one: that was taken way back in 1986 on Tri-X Pan film pushed to about 1000 ASA by boiling it in nitrogen. 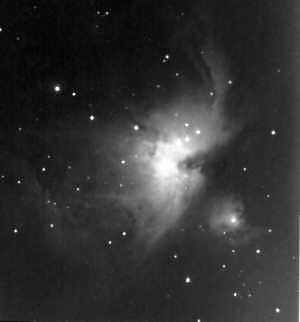 The image is a 20 minute exposure through a Celestron C-8 at f/10, manually guided with an illuminated reticle eyepiece. I developed this in my bathroom using duct tape and towels to block all external light from entering. What a difference! New technology brings better sensitivity and a whole new world of imaging…. but we knew this. I’ve been playing with CCDs since the early 1990s. No surprises. The real surprise? Cost! All this tech adds up in cost. I am not really sure that it saved me a whole lot of time to make the new image with the new tech… perhaps if both images were color? Then, yes, the new tech has saved me time. Simple? M’eh. It’s about the same level of technical detail. It ends up being about one’s knowledge base: software or film developing? You choose. Certainly some of my best images were taken with film. Which do you prefer? It’s totally up to you. Like vinyl records, film is making a comeback, but hasn’t made its way to the realm of astrophotography again. I am pretty sure that CCDs and CMOS sensors are here to stay for astro-art imaging. PixInsight sounds interesting: check out their site here. iOptron? Check out their site here. On the night of 16 December for mid-latitude northern observers, looking south, this is what you should see…a lovely view of Orion and surrounding constellations. The comet should be near the Pleiades, making for a fine photographic opportunity. A good meteor shower to watch is the annual Orionids. This one originates from the famous comet: 1P/Halley – yep, that one! As the comet orbits the Sun, little particles are left behind all over the place along the path. When our planet orbits through this debris, we see a meteor shower. This year, the peak night will be October 21-22, 2018… some time around 2:00am will be when the shower radiant is high in the sky. All you need is a good dark sky to view from. No optical gear is needed. Suggestions for those nearing winter: A sleeping bag, hot drinks, and some snacks. The image below shows that evening at about 1:30am local time with Orion rising in the southeast. The small red circle is the radiant from which the Orionid meteors will seem to emanate. 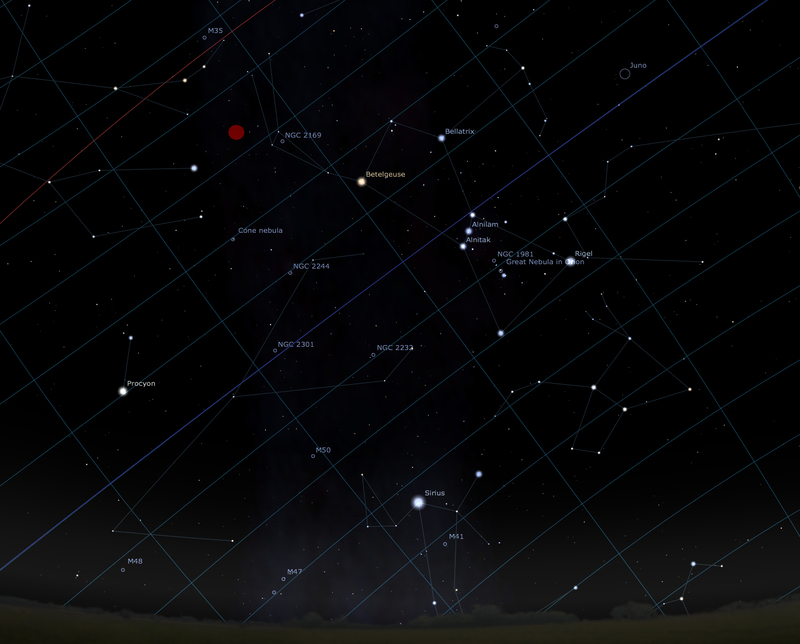 The sky as it will appear in the early hours of the morning looking southeast. The Orionid radiant: red circle. Venus and the Moon June 16th 2018 looking west after sunset. While you are enjoying the view, take a close look at the Moon. You might just see something special, some Earth-Shine. When the unilluminated portion of the Moon is visible, this is due to sunlight reflected off the Earth, bouncing back to light up the Moon, and making it appear a faint eerie blue color. Binoculars will make this really prominent. Enjoy! With some more time back at the regular computer, I have had the ability to merge some of the eclipse images together to make a solid HDR image of totality. This is what I call quite the Photoshop workout. This is a merge of 12 images ranging from innermost corona out to the outermost corona that did not wipe out the moon’s dark disk. Some 20 hours went into this. The star to the lower left is Regulus in Leo. The eclipse was a perfect success! Clear skies prevailed throughout totality, with forest fire smoke and clouds coming in after it was all done. The temperature dropped from 88 to 68F, stunning! The corona was larger than those I had seen before. We had prominences and more. MANY images to deal with and not fast internet, so please be patient while I get these things edited and out there. It might take a while… a week or more. In the meantime, here are a couple of unedited shots. Casper was most generous: we had an excellent space from which to observe: green grassy fields on to the hill to the east of town. The parking lot lights and grass watering sprinkler systems had been disabled for the day. The medical center even provided a lunch at the end! Totality: This is the mid-corona using a longer exposure to show the fainter regions. Totality: The inner corona. Note the fain, pink solar prominences on the right limb. Partial stage as the eclipse begins. There are a few sunspot groups to see there. The diamond ring as the eclipse reaches totality. All, I am safely here at Casper, Wyoming, right on the line for the eclipse. We DID have rooms in the local motel (YAY!) and have been rambling through town a little to get oriented. The town is divided in a couple of neat ways: the Platt River runs through as does a major train route frequented by the BNSF RR and others. The town has a basic grid layout with a couple of highways to help with faster circumnavigation. It is clear, sunny and hot, and the weather is supposed to stay that way through the eclipse. Restaurants and businesses are all out in full force with eclipse gear: shirts, hats, pins, logos, stickers, drinks. One can not make way through town without seeing some reference or another. Yesterday as we drove into town, there was little in the way of traffic, so I surmise that there will be a LOT of traffic today and tomorrow. 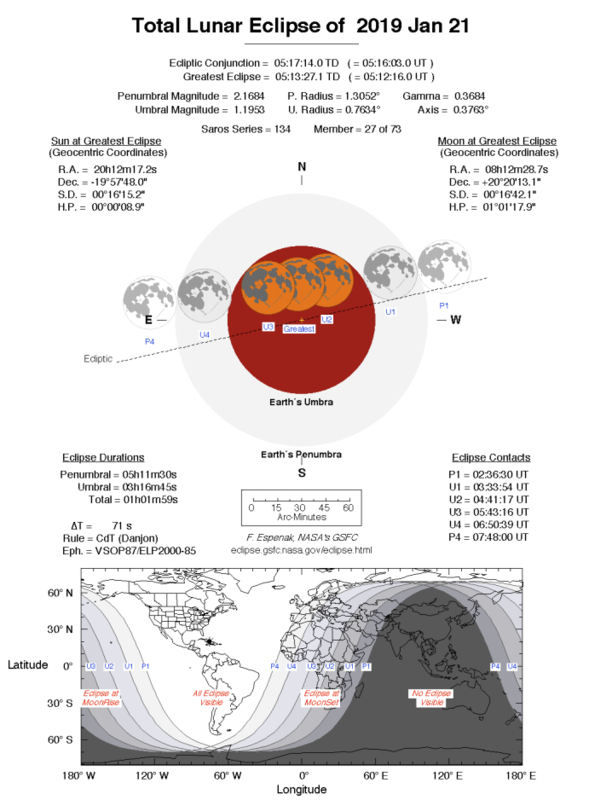 In short: ALL is GO for eclipse 2017 here.